In this medical malpractice case, improper PEG tube placement technique cause damage to the bowel and subsequent surgeries. During a normal PEG feeding tube placement, an endoscope is used to transilluminate the abdominal wall while palpating the abdominal wall. The allows the surgeon to safely place the t-fasteners without injuring the bowel. A needle is used to perforate the abdominal and stomach walls and pass a guide wire. 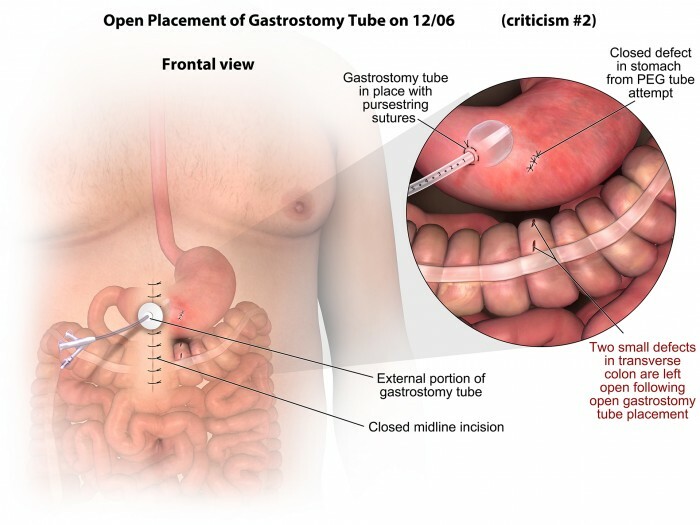 Use of a dilator allows for smooth placement of the gastrostomy tube. During this patient’s surgery, the transillumination of abdominal wall was not achieved. This is and indicator that the surgeon should proceed with an open approach due to the risk of puncturing the bowel. The bowel was punctured sometime during the procedure. After failure to place the tube, the surgeon did proceed with an open approach, but failed to identify and close the injuries to the large bowel. The first surgery resulted in an abdominal infection and a enterocutaneous fistula where the bowel opened into the opened incision. The second surgery repaired the large bowel, but retention sutures were not placed, which lead to further surgeries to debride the wound and close the abdominal wall.